2. Do you have any friends? 3. How much could your job possibly pay? 4. You’re in Mensa, aren’t you? 5. You tell people at parties that you’re in Mensa, don’t you? 6. Do you date online? 8. Do you get asked out people who only want you for your insider LSAT knowledge? 10. Is your kid prohibited from taking an LSAT you write because that’s like really corrupt? 11. Do you dream in conditional logic? 12. Is the best answer B? 13. If Oliver gets a 160, and Miguel gets a 172, for how many people taking the test do you know their exact scores? 1. It’s too cold. No, too hot. No, too cold. 2. It’s too muggy, that’s the problem. 3. If it’s too muggy, then I cannot concentrate. What’s the contrapositive of that? 4. Where the *!& is the clock? Oh, there it is. 5. Um, why is the clock in the room not working? Oh, it is. 6. What am going to do with all the free time I’ll have after this? I should go to the beach. 7. The amount of construction going on outside cannot be normal. 8. Did I bring enough pencils because what if all seven break? 9. Who smells like Thai food? 10. I don’t even know how to feel about what just happened in that section. 11. I’m going to have the biggest margarita after this. 12. Stop thinking about margaritas. 13. I can already taste it. 14. It is disorienting how naked I feel without my cell phone. 15. Essay time! Almost done! Okay, focus. No, not sleep, FOCUS! 16. Where is my car? Wait, did I drive here? Studying for the LSAT? 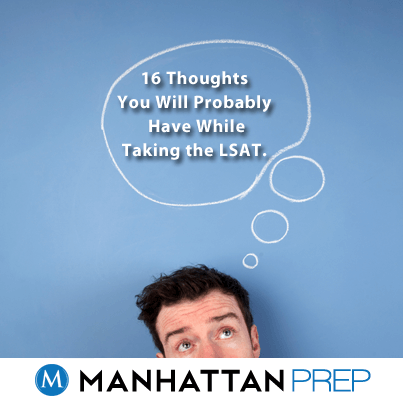 Manhattan Prep offers a free practice LSAT exam, and free Manhattan LSAT preview classes running all the time near you, or online. Be sure to find us on Facebook and Google+, LinkedIn, and follow us on Twitter!